“Let me think of all the things that have changed so much,” Sergeant Mike Mahaney pondered, sitting in the driver’s seat of an unmarked squad car, a battleship grey Chevrolet Impala. Sgt. Mahaney, hired in 2003, is the New College Police Department’s (NCPD) most senior law enforcement officer (LEO). Campus security has changed drastically since the early 2000s, but its evolution since New College of Florida’s (NCF) 1964 charter class presents an deeper story about the changing role of policing on college campuses. In 1970, the Florida legislature passed a law mandating public universities recruit security officers with the same training and authority as city, county and state police. 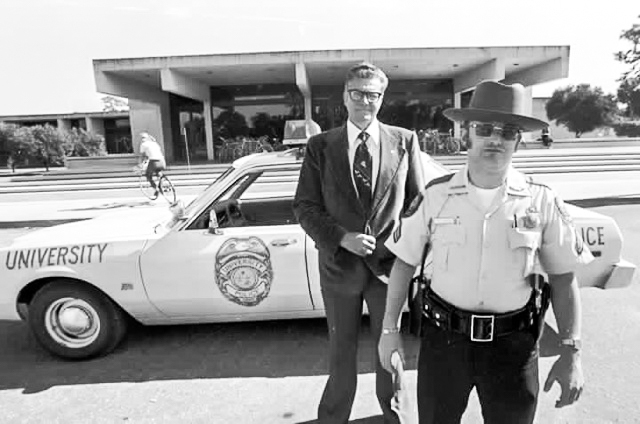 Before NCF’s 1975 merger with the University of South Florida (USF), the then-private college was patrolled by unarmed security guards. Records from the few years after the merger suggest that armed LEOs were a generally unwelcome development. In a 1977 faculty meeting, the late Professor Emerita of Political Science, Margaret L. Bates, suggested that students felt that the college’s security had become more “obnoxious,” and that students felt they were living under a police state. “Some claim that the presence of armed police and the bureaucratic USF administration administrative structure are severely damaging the anarchic, innovative spirit that prevailed when New College was a private institution. This is the hottest issue on campus,” a 1978 issue of the Yale Daily News notes. These sentiments are not new, and they persist even as students graduate and officers retire. In 1994, former New College Student Alliance (NCSA) President Ed Moore worked with administration and the NCPD to organize a meeting to defuse tensions between police and students. The meeting was not well-attended. 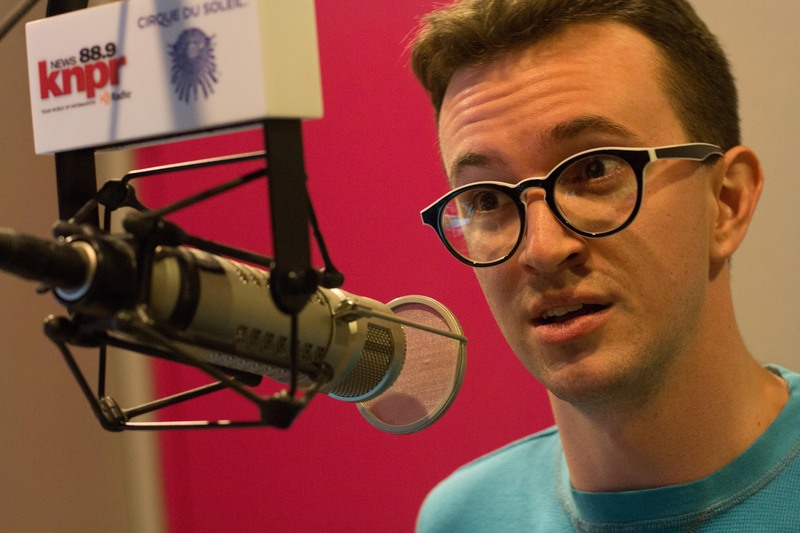 “Campus culture has changed since I’ve been here, largely due to the radically different, almost antagonistic, approach the campus police have taken,” thesis student Michael Pulsifer said. Campus police departments first came into vogue within state university systems (SUS) after the turbulent student uprisings of the 1960s. State legislators and university administrators felt that an in-house approach to campus law enforcement would foster a closer and more productive relationship between LEOs and students. The Clery Act, a federal regulation passed in 1990, further codified campus safety procedures by requiring colleges and universities to track, publicize and respond to crime on or near their campuses. University of Pennsylvania criminologist Emily Owens found that, generally, campus police departments are more focused on student safety and harm reduction than local law enforcement. When Sgt. Mahaney joined the NCPD in 2003, the police were based in the Viking Motel and he was the youngest of a cohort of old-timers–New York transplants enjoying the relatively relaxed pace of life on the bay. According to Sgt. Mahaney, the biggest change he has noticed over the years is in the makeup of the police force. The officers are much younger now. His concerns are the same though—troublemakers on campus are usually non-students—and he doesn’t hesitate to issue trespass warnings. Sgt. Mahaney noted that, these days, far fewer students request police escorts when crossing campus at night. Sgt. Mahaney agreed that policing at NCF has evolved in response to certain watershed events. In 2008, a student was assaulted by a non-affiliate at a Wall. The administration’s current policy requiring at least two police officers to patrol on Wall nights and a Wall curfew of 2 a.m. was the direct outcome of that event. Records available in the NCSA archives indicate that security protocols were strengthened after a 1984 incident in which a student was assaulted by a non-affiliate in a Pei dorm, and in 1995 a Palm Court Party (PCP) was abruptly shut down after a non-student threw a beer can at an officer. A sponsor of the PCP described the shutdown as “the largest scale of control in New College history.” According to a 2008 memorandum from former NCF President Gordon “Mike” Michalson, the network of blue emergency phones around campus was put in place in response to shootings at Virginia Tech and Northern Illinois University. The use of technology in ensuring the safety of the campus community has evolved over the years. Officer Kelley Masten, one of two officers who manage the NCPD’s Facebook, Instagram and Twitter accounts, said that social media is an important part of keeping the community informed. According to Sgt. Mahaney, the NCPD’s communications department at one point consisted of a single telephone. A peek inside the dispatch center now reveals a vast grid of camera feeds, and the department can notify the community through text, email, social media and a PA system. “We’re as close as possible to a 911 center,” Sgt. Mahaney said. 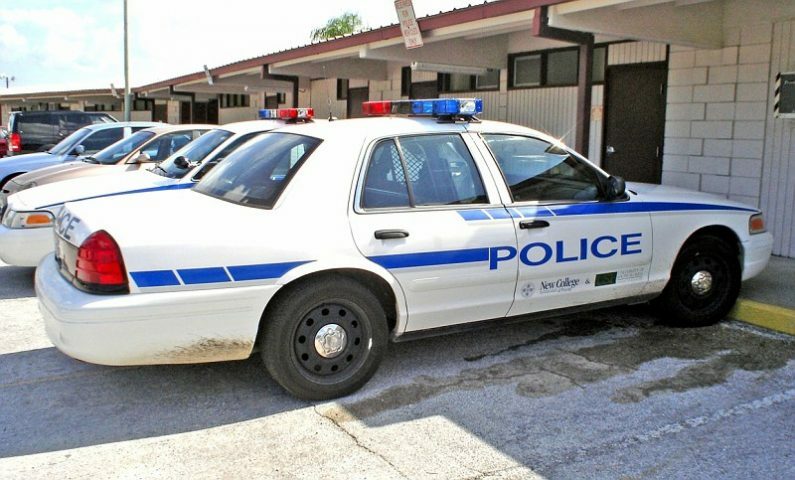 Campus police departments in Florida have consistently expanded over the years. Between 2006 and 2016, the Florida Board of Governors (BOG) increased the NCPD’s budget from $555,772 to $825,564. The BOG requested another $750,000 for the 2016-2017 fiscal year to pay for seven new personnel, updated equipment and training programs. “Chief Kessie has implemented everything that we do now, for the better. Everybody needs training, the training only helps us to help the community,” Officer Masten said, adding that trainings are now significantly more frequent and thorough than when she was hired in 2010. Sgt. Mahaney and Officer Masten maintain that the NCPD is chronically understaffed. Funding increases allowed the recruitment and training of two new officers last year, and the department is currently in the hiring process for more personnel. According to Officer Masten, when leave time and training schedules are taken into account, the department is still at its 2002 staffing levels, but with greater responsibility put on individual officers. There are currently nine full time officers on staff, not including three sergeants, who also have patrol duties. The International Association of Chiefs of Police (IACP) standard for effective community policing is two officers per 1,000 students. As enrollment increases, other Florida universities are currently struggling to meet this standard, with the University of Central Florida (UCF) reporting a paltry ratio of 1.06 officers per 1,000 students in 2015. The combined enrollment of NCF and USF Sarasota-Manatee is approximately 3,000, a ratio of three officers per 1,000 students. Even though the NCPD’s resources have increased in recent years, it’s clear that money isn’t everything when it comes to fostering a friendly and respectful relationship between students and police. According to Sgt. Mahaney, the 2013 release of the New College Police Presence White Paper led to an increase in negative feelings towards the department. Information from FLBOG.gov, the Catalyst archives, the NCSA archives, the Atlantic, and the Miami Herald . The unidentified police officer in front of Ham Center is Officer Paul Schiedler (sp?). I’m pretty certain that the correct spelling is “Shidler.” During the late ’80s or early ’90s, while chasing a suspect (not a student) who was in the process of running away from him, Officer Shidler de-holstered his handgun and fired a round in to the air (yes, next to the airport). This fact was repeatedly verified by other officers when I was there (’92-’95). Rodrigo is correct, albeit with a slight spelling error…the uniformed officer is Cpl. Paul Shideler. The man behind him is Chief Walter Hooper. Chief Hooper was the first University police chief. In my student days, (1970s) I had a work-study job as a dispatcher.in the cop shop. The first UPD officers were largely retired New York City PD officers. Shideler being an exception. Bill Kelly was one of the NYPD retirees. Bill went on to succeed Chief Hooper when he retired. Chief Kelly brought in a number of NYPD retirees: Paddy O’Boyle, Andy Murray, Hughie Roarty and a few others whose names escape me at the moment.. The nature of the PD has changed quite a bit since my days on campus…The whole topic of the early days of security and police on campus probably merits another article.